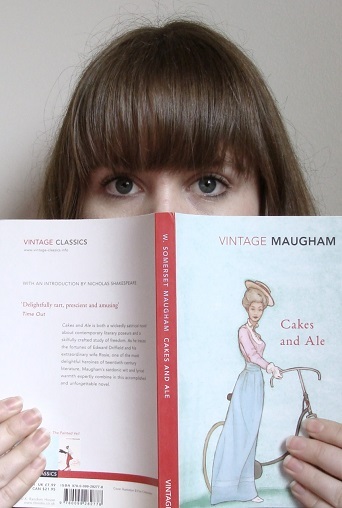 Cakes and Ale is a rather biting satire of the life of various notable British writers, including Thomas Hardy, who were prolific in William Somerset Maugham‘s time. Though he vehemently denied that there were any links between his characters and real life figures, which I suppose makes the definition of it as a ‘satire’ a little presumptuous. But at the time it was published Virginia Woolfe saw one of Maugham’s friends in tears, as he saw that one of the characters presented as an unscrupulous literary social climber who churned out books of low quality, was actually himself. My favourite character in this book was Rosie, around whom most of the novel winds itself. She is vivacious and flippant, the muse for many of the central characters, and ultimately somewhat enigmatic in her motivations and desires. You can see an artists impression of her on the cover of my copy, from the first scene in which the protagonist meets her. Aside from her strength and sense of fun, her ability to ignore with ease the social conventions of the times are what made her so much fun to read about. You can find more quotes from the book on wikipedia and other places around the internet, but if you find these entertaining or interesting I suggest you buy and read the whole book. It is quite short, and as it is now published by ‘Vintage’ it is also quite inexpensive.